The Better CRM - Built For Sales, Used By Sales! Businesses of all types have become increasingly complex and most companies struggle to bring consistency and predictability to how they operate, in particular to how they sell. We have partnered with Pipeliner, the most visual CRM on the planet, to solve this problem. By working with us to get the flow between sales behaviours and sales processes right, you’ll have a powerful cross-functional tool for keeping everyone in your sales organisation on the same page. Online, Offline, Mobile or in the Cloud, Pipeliner CRM provides easy-to-use, visual tools to manage every stage of the customers journey from lead to opportunity to sale to renewal while streamlining your business, saving you time, focusing your attention and significantly accelerating your success. A sales tool that your people won’t use is a ridiculous waste of time, energy, and money. Why not give your team what they want; an easy-to-use, visual sales pipeline tool that they’ll love to use? Pipeliner CRM - It’s All About Sales! We invite you to try Pipeliner CRM on a FREE 14-Day Trial. Just click the button, register and get ready for a completely new CRM experience. Why is Pipeliner so popular with Sales Professionals? Pipeliner CRM is CRM software designed to actually empower sales professionals: it is Instant Intelligence, Visualised. A CRM system is only as good as the way it presents data for salespeople and sales management to use - not everyone has the same requirements and preferences. For that reason, we give you multiple ways to view your data. Explore the key features below to learn more. Along with Pipeliner’s advanced filtering and profiling capabilities, Navigator immediately helps the user cut out the noise, easily navigate complexity and focus immediately on what is most important. From the very beginning, Pipeliner was designed for the precise purpose of being customizable to a company's sales process. Within minutes, Pipeliner is instantly adaptable to a company's specific sales process stages. If a sales process changes down the line (which often happens with a dynamic sales process) it can be immediately updated. With Pipeliner Performance Insights you can instantly see how sales is performing using using 5 Key Performance Indicators: Deal Created, Deals Converted, Lost Deals, Value of Won Deals, and Value of Lost Deals. You can even see your own results and see how well you are performing. It’s easy to compare the performance of your salespeople—simply select the KPIs that you are interested in, and turn on the graph view for the individuals or sales units you want to compare. Pipeliner CRM On The Go! This is especially true of sales. Salespeople by nature are getting out, reaching out to prospects, visiting them, looking them up at trade shows or conferences. They also might be meeting them in social settings that have nothing to do with work. When such things occur, you’ll often need access to your CRM. Pipeliner knows this, and for that reason provides a robust Mobile App for Pipeliner CRM. Click Here to learn more the mobile App. Author of this ebook, Nikolaus Kimla gets very specific, dealing with sales management through CRM. He personally believes (as do a lot of experts today) that utilizing a CRM is the only way to manage a sales team—and in fact it is practically impossible to manage one without it. 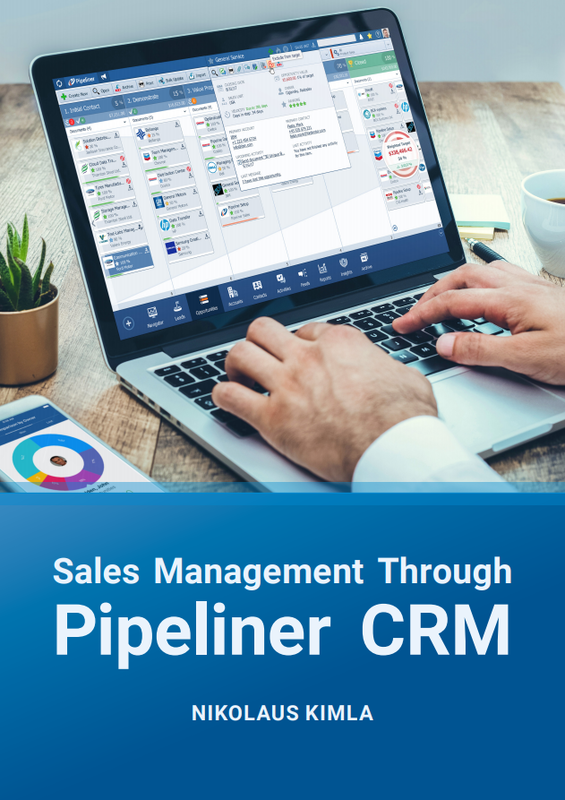 There is no system in the industry today like Pipeliner CRM, one that empowers precision sales management through CRM. Therefore we can truly say that Pipeliner CRM is the only really effective tool available today in the market. In this book we break sales management through CRM down into 4 basic functions, with a chapter covering each. Artificial Intelligence and the Future of Sales. While artificial intelligence has been predicted for many years, especially through science fiction movies and television, it is truly now coming to pass. But when it comes to sales is Ai friend or foe? It is this complex and timely topic we're going to be exploring in this e-book. Download your copy below. What Does Fitness Mean for a Salesperson? Fitness is an interesting subject. It certainly means staying bodily fit, and the tens of thousands of gyms seen all over our cities serve as reminders of how much attention people have on toned physiques today. But it also means staying fit in mind and spirit, and in fact, it's a coordination of all three. In this e-book, we're going to explore what fitness means for a salesperson - and it's a lot more than being buffed out! Download your copy below. As you might guess, since Pipeliner CRM is such an advance in its approach to sales, it contains a host of additional features you and your sales team are sure to love. Please complete this form to book a demonstration and learn how Pipeliner CRM can help you and your salespeople to close more deals by more effectively navigating the fog and complexity of today's hyper-competitive sales and business environment. Thank you for your interest. We will be in touch very soon. Pipeliner includes many unique features such as Navigator, Performance Insights, visual Task Board and instant one-click reports that you won't find anywhere else. Additionally, we include other features such as Org Charts and Visual Buying Center that, with other CRM applications, you would have to pay extra for, or purchase from third-parties. With Pipeliner, you get these features right out of the box. Whatever you're looking for from a CRM, chances are we have you covered. Tour the video's below to see how Pipeliner CRM Software helps salespeople, sales teams and sales leaders to improve the odds of winning deals. You’ll quickly see why so many companies are turning to Pipeliner CRM to unlock the true power and potential of their people. A CRM That Actually Supports You! Pipeliner was developed to empower salespeople and sales leaders - not weigh them down with cumbersome data entry and a complex and difficult-to-use application. Pipeliner means smooth navigation through the complexities of today's selling and business environment - bringing a whole new level of consistency and predictability to your business. It is the most visual CRM on the planet, always available and won´t break your budget. Isn't it time you gave your salespeople the best possible tools and intelligence on which to base their decisions. Complete the form below and a member of our awesome team will be in touch.